Scouting round the campsites and grandstands there are still Foggy T-shirts and caps everywhere, but even though The Great One isn’t there to race any more, it seems the fans like it just as much, or more, than when he was at the height of his powers. Brands has truly graduated into an event in its own right. 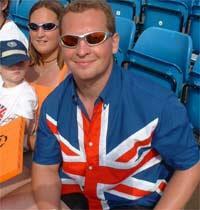 Andy Wilson from Middlesbrough turned up at Brands wearing a Union Jack shirt, so it's obvious where his loyalties lie – not as obvious as it first sounds, with so many foreigners now making the trip to Kent. We ask him what he thinks. He said: "The atmosphere is absolutely great, second to none. But you have to move on. Fogarty has retired now but that shouldn't mean we can't enjoy it. Hodgson and Toseland are doing the job and so are the wild-cards. As far as I see it, it is as good if not better than then Foggy was racing." Darren Morgan comments that he reckons it was better when Foggy was there, that today was missing the elusive X-factor which the four-time champion brought to the event, but he added: "As long as the British are doing well, I am happy…" With two podiums for Hodgson and Whitham, and wins for Brits in other classes, we think he went away with a smile on his face then. One group who nervously awaited today's races were the organisers at Brands – more than most they felt they had something to lose if the fans decided they didn’t want to party in more. The circuit pulled out all the stops this year to make sure things went smoothly and to counter criticism after last year's event that, simply, the venue wasn;t up to the job of coping with hundreds of thousands of spectators. The view seems to be that they have succeeded. Simon Lewis and Jane Seldon went last year and said: "It actually seemed busier last year, but this year is much better organised. There is the same buzz and atmosphere, which makes it such a good weekend, and the British support is excellent." Lyn Fitzpatrick from Cambridge went to Brands as part of MCN's Brands trip to the Hilton Hotel down the road and she said: "It has been brilliant. We had lunch with Frankie Chili and Niall Mackenzie. It as good without Foggy, so many Brits are doing well." But even those who proudly wore the colours the Number 100 GSE man Hodgson think he has a way to go to take Fogarty's place in the fans' hearts. Vince Brown said: "Hodge has taken over but Foggy is still the man. I would love to see Carl manage a team with Neil as the rider, the king and the new master."